Test up to 1.000 webpages of schreibblogg.de with our free plan! This page contains 869 words. That's ok.
23.7% of the text are stop words. The average number of words per sentence of 11.92 words is good. The usage of strong and bold tags is perfect. We recommend the use of up to 17 tags for this page. There are 31 headings on the page. The amount of headings should be in a more proper relation to the amount of text. H3 Herzlich willkommen, lieber Karl-Heinz! H3 Viel Spaß beim Stöbern! H4 Ein herzliches Dankeschön, lieber Karl-Heinz! There are 12 external links on this page. /ueber-connie-ruoff/ Über mich – Connie Ruoff! https://connies-literaturblog.... External Text duplicate Über mich – Connie Ruoff! https://connies-literaturblog.... External Autoreninterviews – Was wollt ihr wissen? /interviews/ Text duplicate Autoreninterviews – Was wollt ihr wissen? /meine-rezensionen/ Buchtipps – wie wird bewertet? 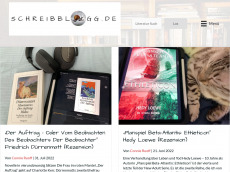 /buecherblog-literaturblog/ Herzlich willkommen im Bücherblog „Connies Schreibblogg“! /ueber-connie-ruoff/ Text duplicate Über mich – Connie Ruoff! A-TITLE Powered by WordPress, state-of-the-art semantic personal publishing platform. This website redirects to "https://schreibblogg.de/"
This website loads 17 CSS files. This may affect the page load time negatively. The file size of the HTML document is fine (85 kB). This website has backlinks from 57 referring domains. This website has 3,323 backlinks. This website has backlinks from 54 different ip addresses.